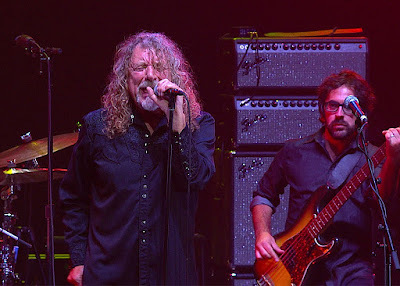 Robert Plant and The Sensational Space Shifters perform the Led Zeppelin classic, “Whole Lotta Love”, in a preview to the March 5 AXS TV broadcast premiere of the singer in concert at the Ace Hotel in Los Angeles, CA last fall. Plant’s performance was part of David Lynch’s Festival of Disruption, a two-day music, art, film & creativity festival curated by the legendary filmmaker. The rocker’s set also kicks off AXS TV’s new Sunday Night Rocks series, which will feature concert broadcast premieres by artists including Def Leppard, Blondie, Ringo Starr and His 2016 All Starr Band, Mavis Staples, Alan Jackson, and a tribute to Kenny Loggins. He can also be heard as a guest on the upcoming May release by UK folk-rockers Fairport Convention, “50:50@50.” Plant sings the gospel tune, “Jesus On The Mainline”, on the project, which marks the band’s 50th anniversary.